Just when I thought I had hiked most of the major attractions in New Mexico, yesterday, I stumbled into the Ojito Wilderness, a place I hope to return again and again. Before yesterday, I had never heard of Ojito, but I can now say, without hyperbole, this pocket of wilderness in western New Mexico is one of the most incredible places on Earth! Turns out, I’ve driven past the road to Ojito many times on my way to Cabezon Peak and Chaco Canyon. The Ojito Wilderness lies on BLM land less than an hour northwest of Albuquerque, due west from my place in Cerrillos. You might not think that true wilderness could lie so close to a major city, but with its remote and rugged terrain, Ojito certainly qualifies. 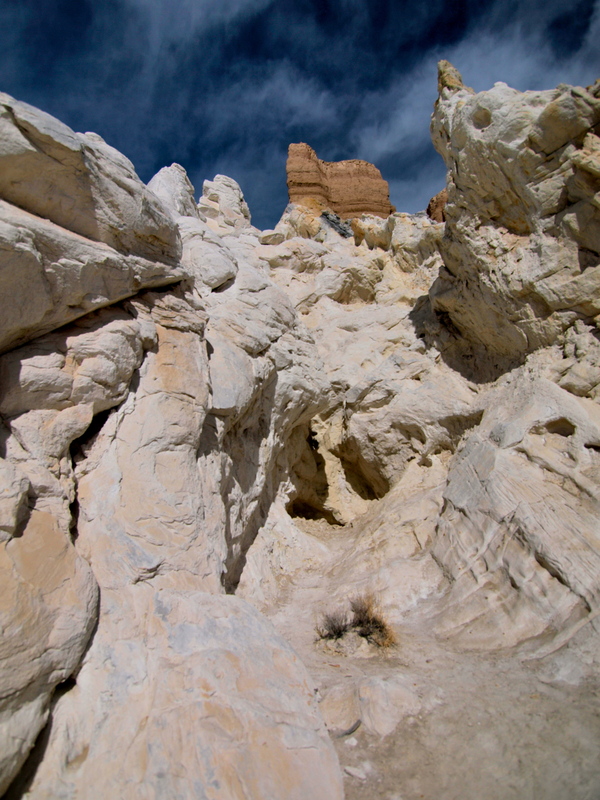 By the time you drive the four miles of washboard-riddled dirt roads from highway 550 and cross the first cattleguard onto the BLM land, you’re firmly in another world: one of hoodoos, unmarked trails and rampant gunfire. Yes, gunfire. 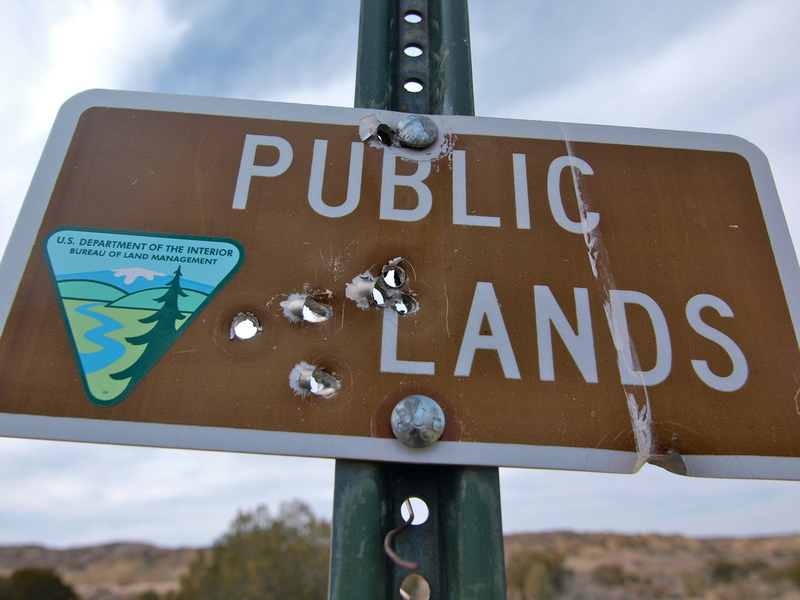 On this remote area of land it’s legal to pull over your truck, unload a bazooka and fire away at a distant mesa, as long as no cows or hikers are in the way. Not just rifles and handguns; on our way to the trail head, we passed a dozen trucks with men wielding what looked like serious assault weapons. I suppose as long as it’s legal to own such ridiculous guns, it’s important that people know how to use them properly. If you’re going to shoot somewhere, might as well be a place like this, far from just about everything, but I’m never thrilled about sharing the wilderness with people shooting off guns. All the shooting was aimed at the BLM on the south side of the road and the Ojito Wilderness lay on the north side, so I wasn’t too worried about actually getting shot. 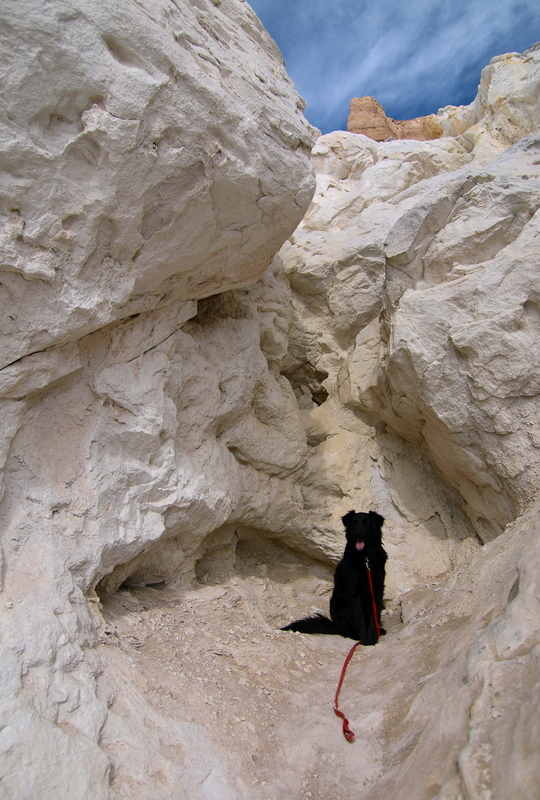 My poor gun shy dog Dio, however, spent most of the day trembling and trying to hide under a rock. Dio is a former rez-dog stray and he clearly knows guns are bad news for wandering dogs. I don’t want to think about how he learned that lesson. It’s a testament to the sheer spectacle of Ojito that ceaseless gunfire could not detract from the incredible beauty of this place. Ojito has three main hiking areas. We started at the Colored Bluffs Hike: a series of brightly colored badlands hidden within a maw of jagged, uplifted slabs of sandstone. The colors here, ranging from stark eye-searing white to teal, bright yellow and brick red, reminded me a lot of Artists Palette at Death Valley, where the weathering of metals and minerals within the soft layers produces colors and textures you never thought possible in rocks. The geology at Ojito reminded me of several different National Parks, but the trails were a far cry from the Park system’s neatly laid out paths. 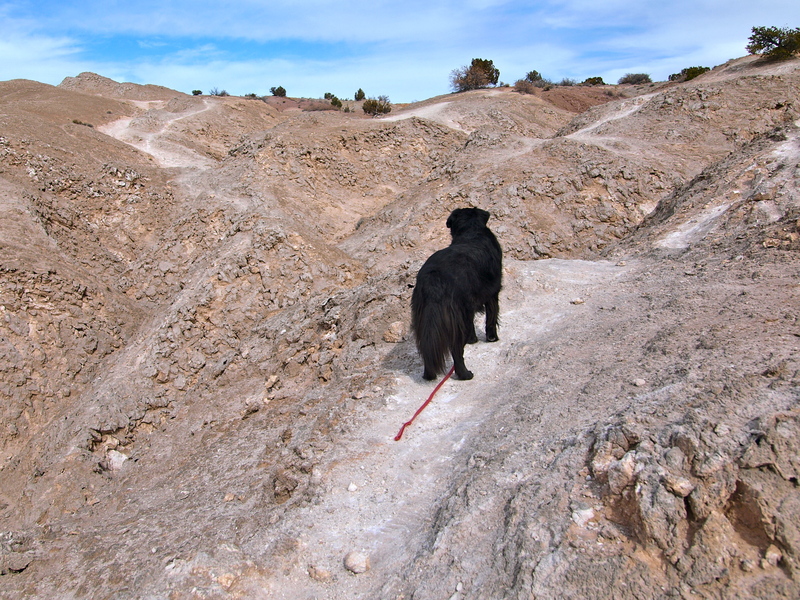 None of the trails at Ojito are marked and in fact, you’re not required to stay on a trail at all. This is a place for wanderers. I love hiking in these kind of places, but I’ve also been practicing off trail navigation for years. It’s so easy to get drawn into a place like this, be so fascinated with each surprise around the next bluff that you look up and suddenly realize you have no idea where you are or from which direction you came. People get turned around and hopelessly lost in places like this. 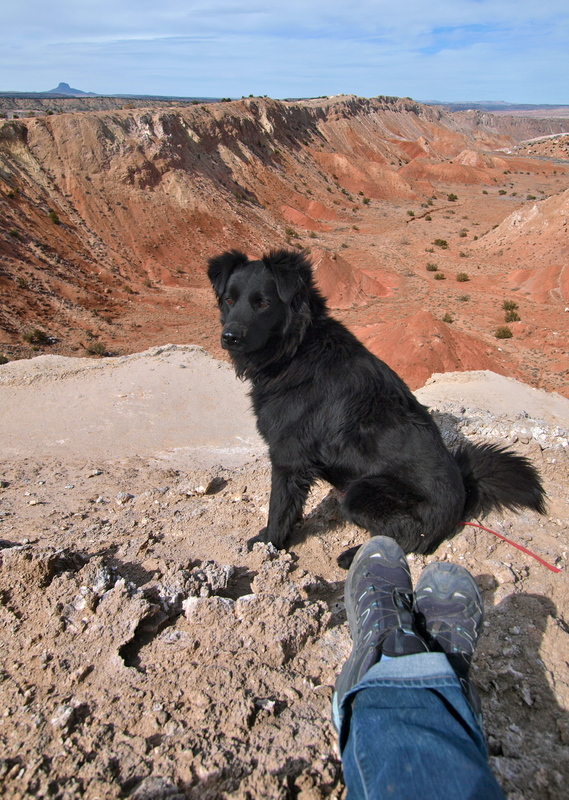 Dio on the edge of the Anticline. Revel in the magnificence of wandering in sheer space, but make sure you can find your way back home! The key to keeping a sense of direction in the desert is to constantly retriangulate your position. For some people, that means using a GPS and that’s a fine way to navigate, as long as you can get a satellite signal and your batteries don’t run out. Navigating by map and compass is a necessary skill for hikers, but it’s not intuitive. If you plan to set out into a place like Ojito, first look into taking a Map & Compass course at your nearest REI. Most stores regularly offer the course for between free and $15. Yesterday, I had a map and compass but I never took them out of my pack and still managed to negotiate a perfect loop through the wilderness and back to the car. Creating a mental map of a place and accurately tracking your position within that space is a skill that can only be mastered by purposely getting yourself lost and then getting yourself found, something I’ve been practicing on a nearly daily basis for the past seven years. 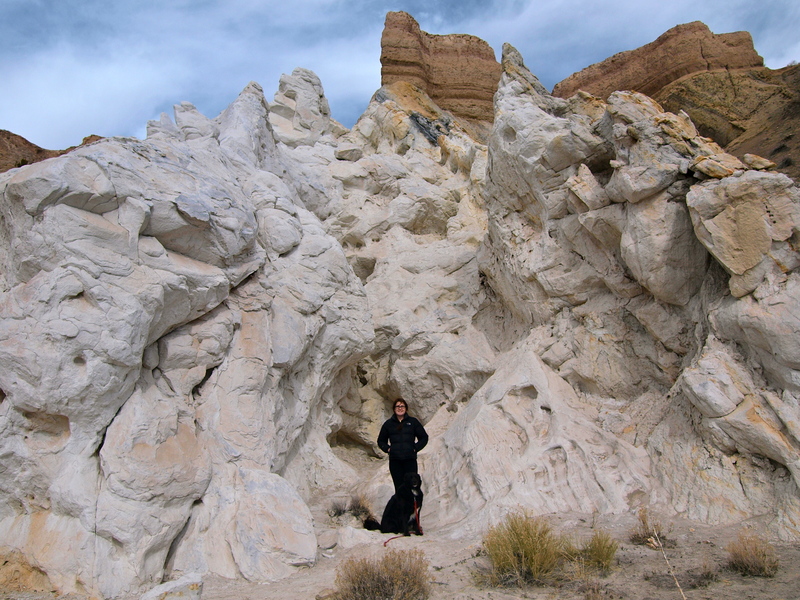 At one point, engrossed in photographing an incredible, intricate white rock formation that I named the Great White Womb, I realized I hadn’t seen my friend Becky in a few minutes. Instead of wandering away aimlessly to look for her, I sat down and had a snack and sure enough she appeared a few minutes later, looking for me. If she hadn’t shown up so soon, I would have whipped out my whistle to signal her. No sense both of us getting lost while looking for each other. 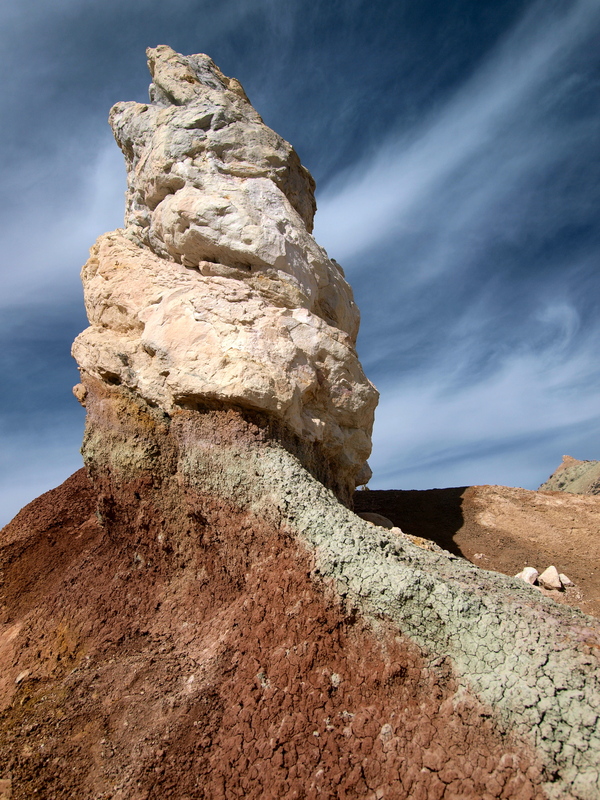 After wandering around the badlands, we climbed up a steep trail to the top of the mesa and headed northwest, towards a massive eroded anticline with views of Cabezon Peak, a magnificent volcanic neck that I climbed last spring. Sitting on the edge, my textbook knowledge of anticlines – a convex dome of geologic layers – gradually aligned with the giant scoop-shaped valley in front of me. Here there was once a dome, but over time, the raised center had eroded away, leaving a long, deep, dark red trench capped by a thick angled layer of white crystalline gypsum. A geology lesson, in the flesh! We got back to the car in the early afternoon and elected to drive further into the wilderness and check out the Hoodoo Pines area. 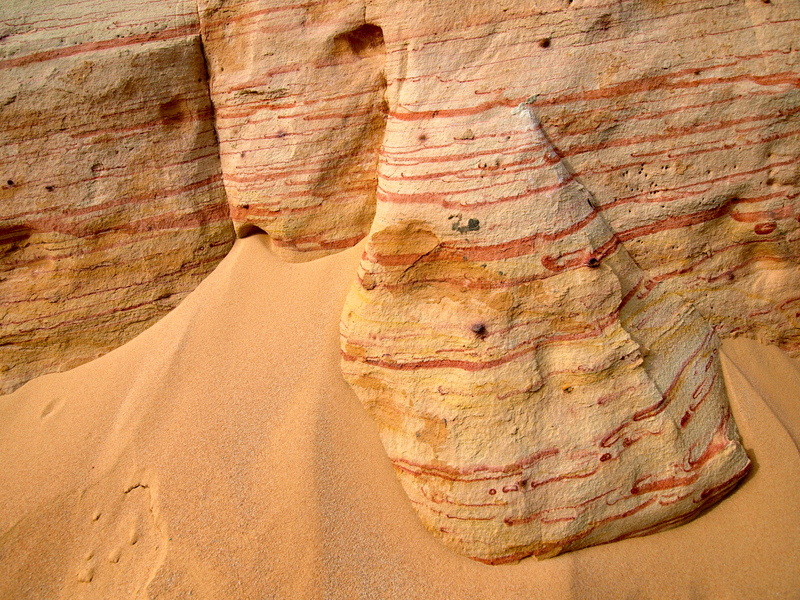 Just when we thought we’d seen everything, Ojito surprised us with one of the coolest rock formations I’ve ever seen: a set of pink and yellow-striped Hoodoos. Desert hoodoos are primarily sculpted by sand-blasting winds (as opposed to freeze/ thaw cycles), leaving behind a pillar of relatively soft rock capped by a harder, protective layer of sandstone. Bryce Canyon in Utah is one of the most famous hoodoo locations, but these, with their delicate striping and vivid colors, might rank in my top three rocks of all time (up there with Tea Kettle Rock and Glade Creek Boulder). Here’s the truly wonderful thing about Ojito: it’s all public land, which means it belongs to you and me. The gunfire was a bummer, but I am glad there are places in this country where you can do what you want and go where you please. Hiking, horseback riding, and camping are all allowed here, for free! No permits needed. One last piece of advice if you’re going to visit Ojito: go on a weekday, when there’s likely to be a whole lot less shooting going on! Click here for more information about the Ojito Wilderness, including driving directions and trail descriptions. More of my photos can be seen on my Flickr page. Enjoy! 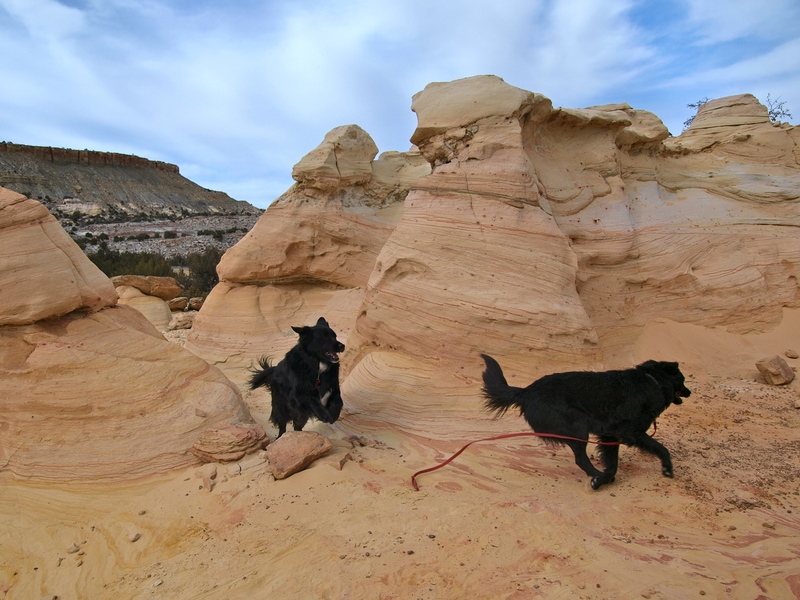 This entry was posted in Bowie & D.O.G., Hiking!, New Mexico, Photography, Road tripping!, Vagabonding 101. Bookmark the permalink. 36 Responses to Into the Ojito Wilderness! I’m drawn into your wonderful scenes and descriptions. What inspiring scenery. Thanks for sharing! Thanks for sharing! Looks like you and your critters are having a wonderful time trekking. And, yes, I’m jealous, although my dog may not be. She likes her home territory. Cheers, Frank. Yeah, put Ojito on your list! I’ve never seen it mentioned anywhere and it’s definitely a hidden gem. Another nice trip, I see. Even the sky was working with you in those photos. Very Nice. If you loved Ojito, you need to take the next step and go to the Bisti Wilderness (or Bisti Badlands, as it’s sometimes called) south of Farmington. The entire landscape is otherworldly, but the most amazing thing is how much it changes in such a short distance, It’s like going from one room to another in a museum. Every time I look at the photos we took I can’t believe they’re real.